The most recent monthly housing approvals released from the Australian Bureau of Statistics show Victoria continues to cater for future housing stock with a combined 5,009 new approvals during November 2014. Of those approximately 2,350 were for high density living with apartments and townhouses the major contributors. The figures and associated graph were highlighted on January 8th by Urban Taskforce Australia, a peak industry body charged with representing property development interests across Australia although with a strong Sydney focus. While housing approvals across Australia are reaching record levels NSW approvals have dropped. Victoria is leading the country with 5,009 home approvals in November compared to 3,958 for NSW which is a significantly larger state. The state election in NSW is only a few months away and clearly the attitudes to growth and the impact on housing supply and therefore the affordability of housing will be an important election issue. We can’t let NSW slide off its Number One status in Australia so we must support growth to remain the Premier State. 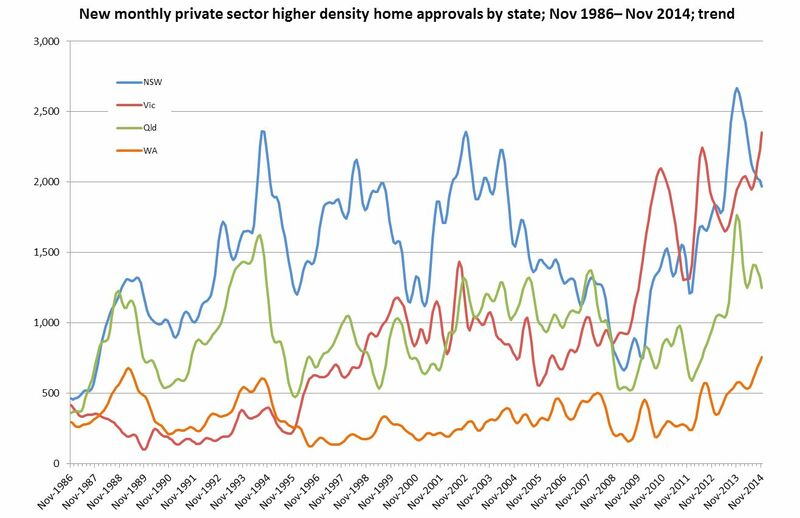 Sydney parochialism aside, monthly high density approvals over the best part of 30 years can be seen in the below graph. Most noticeable is the Victorian sector lagging well behind the other states for many years, although in recent years this trend has reversed, in line with the increased penchant for apartment living principally throughout inner Melbourne. A number of articles on the matter have been published via various media outlets in recent days along with the almost obligatory associated potential for oversupply of apartments in the Melbourne markets; the same spectre which has been present since 2011, yet for the most has been staved off. Special kudos is reserved though for SBS online which reported the direct correlation between heightened Victorian approvals and an increase in apartment oversupply; quite a supposition given these additional approvals are nothing more than paper approvals and do not add to the physical stock of available dwellings. See the Australian Bureau of Statistics latest figures on the topic. This Sydney-centric taskforce is a disgrace, South Australia is not even listed! ....And are we ever going to stop hearing about the Melbourne apartment oversupply rubbish. "With population growth sliding in most states outside New South Wales"
Vic is not in the "most states outside New South Wales" category, yet we have a problem apparently. Population growth estimates for VIC and NSW from the ABS, updated every quarter (for 12 months back to the original period). Given that 85-90% of Victoria's population growth is in metropolitan Melbourne (compared to 75-80% of NSW's growth in metropolitan Sydney), Melbourne is likely to be the city which added the most people over 12 months - they have to live somewhere. Melbourne is just catching up. They used to reassure themselves that Sydney had apartments only because of the sandstone wall surrounding the basin. They didn't realise it wasn't sandstone limiting Sydney, but the same 50km commuter containment ring that Melbourne now abuts. There are no magic tricks once you hit that limit. There is a good post currently on transportblog.co.nz where they have attempted to describe the 'geographic centre' of jobs in the urban area, broken down by industry. While it was no surprise IT, government, banking were centred in Auckland CBD, the surprise was that most other industries w were also centred within a few km of the CBD too. So while many blue collar or low white collar jobs are in the suburbs, they are unable to be dispersed 'on average' except uniformly. And in multi-worker households, you cannot on average find somewhere to live that minimises your joint living cost, except by following the tradition concentric ring pattern. So the limits to urban growth are the same, traditional cbd with radial suburbs or not. Melbourne is stuck with the destiny of all cities.